8/2/2012 PCSchool have introduced the ability to set a users ability to login to PCSchool or Spider, based on the security setting of the equivalent user. Users are created in PCSchool Identity table and are assigned an Equivalent User in the PCSchool back end Security tables. Individual users can have their accounts locked by setting the Account Locked tick in the Identity Security Tab. To disable the accounts of all users with a particular equivalence, disable the account of the Equivalent User. All users attached to that security user will then be denied access in both the Web Spider and PCSchool Back Office. We have now provided a check box as shown below. If ticked this will enable Spider Access even though the Security Equivalent account is locked. 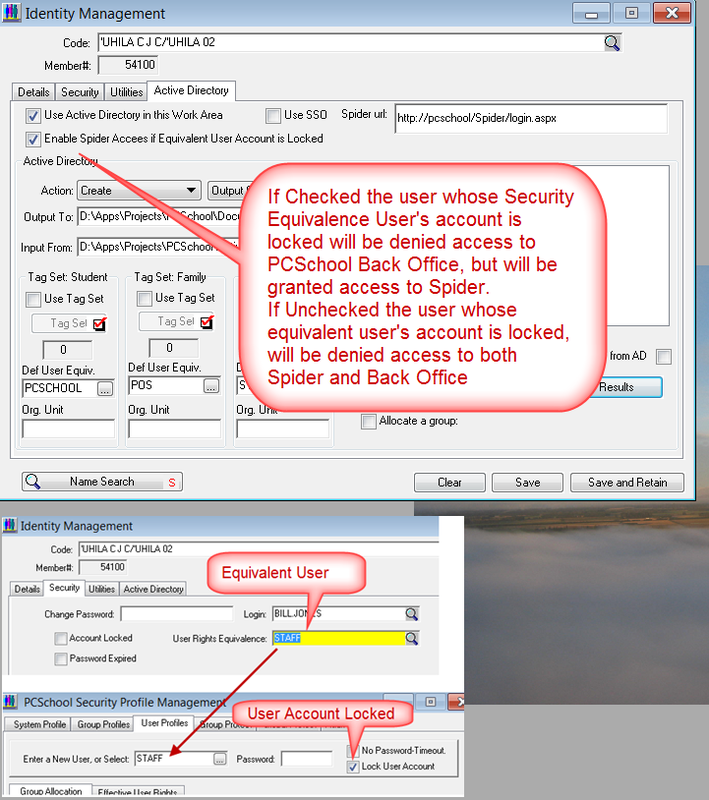 Use of this will enable schools to grant logins to the Spider while denying the same user login rights to the back office. This entry was posted in Security, Spider, SysAdmin and tagged pcschool, security tab, web spider by studentmanagementsoftware. Bookmark the permalink.